Harapeko, which means "I'm hungry" in Japanese, is the most recent addition to Kensington Market's eclectic collection of stores and restaurants. 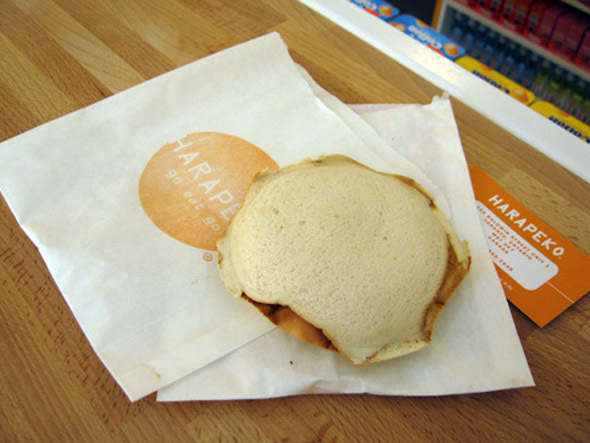 Harapeko is owned by the same people behind Manpuku which means, "I'm full," in Japanese. This small space is more of a snack bar than a full-scale restaurant. It offers a variety of Japanese treats and desserts and an assortment of shakes, iced coffee and smoothies. 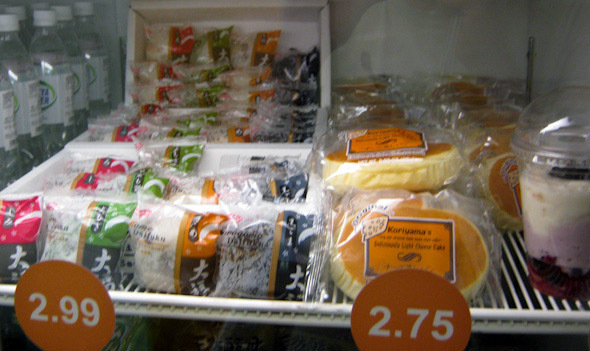 Aside from a staggering assortment of Pockys , there are some cold snacks like mochi (rice cakes) and pastry-type delights. 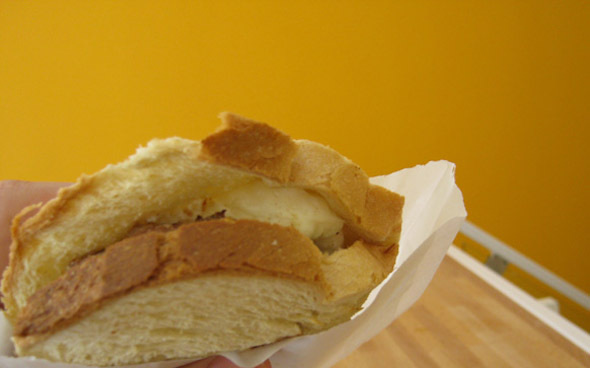 Curiously enough the main food served here, a Pan Pocket grilled-sandwich, isn't traditional Japanese at all. The idea is pretty simple. Pick between white or whole wheat bread and choose a filling. 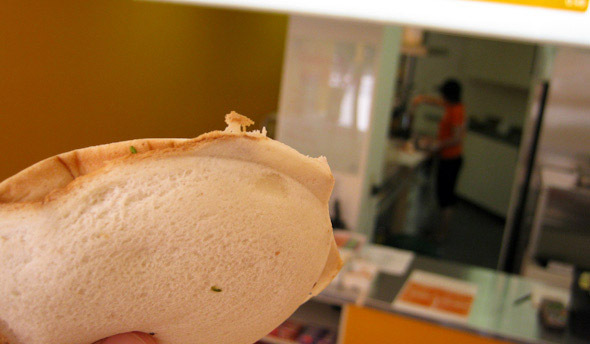 Staff quickly assemble the ingredients and press the sandwich into a grill so that it comes out hot in a disc shape. Someone had recommended the Pork Cutlet Pan Pocket ($4.99) so I try that first. It's a mix of seasoned cooked pork with slight traces of Tonkatsu sauce on whole wheat bread. It doesn't taste overly porky and the cutlet's consistency is nice and firm without being tough. But the size of the meat is pretty large so the bread isn't able to hold the filling together very well. 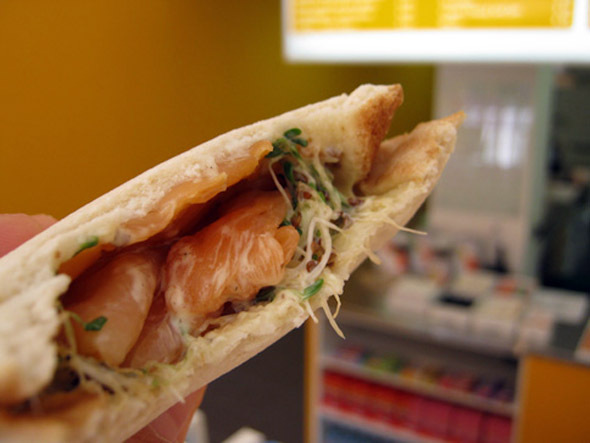 A better option is the Salmon with Mayo and Alfalfa Pan Pocket ($4.99). The mixture of still-cold smoked salmon lavished with Kewpie (Q.P.) mayonnaise and a generous helping of alfalfa sprouts works together really well with plain white bread. It also maintains the pan pocket shape much better than the bulbous pork cutlet. Other combinations on the menu include Beef with Tomato and Basil ($4.99), Satsumaage (fish cake) with cheese ($4.99) and the very peculiar yet intriguing Omelette with avocado or salami ($4.99). The pan pockets alone may not be filling enough for most people so there are also some small salads, soups and side dishes to round out the meal. 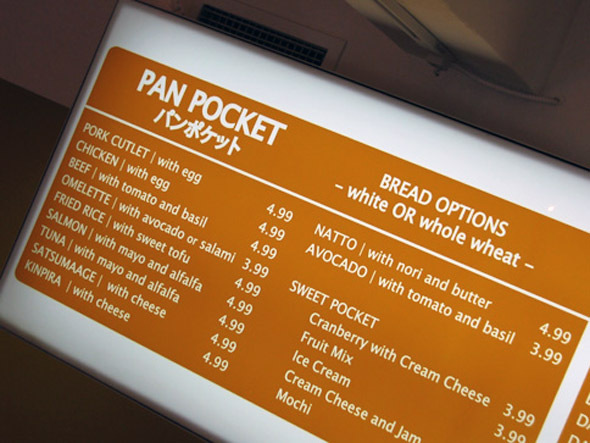 Harapeko's food concept is novel and seems like it could flourish provided they keep coming up with new and interesting combos for their pan pockets. It definitely adds a unique option to Kensington Market's already diverse fast food scene.